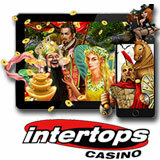 One of my favourites, Intertops, has finally gone mobile with Intertops Mobile Casino! I don't know what took them so long (RTG, their software supplier, has had mobile casino games for ages) but it was worth the wait! By offering games from TWO casino software providers they have the biggest selection of mobile casino games available to players using smartphones and tablets. With a wide selection of mobile slots and casino games from Realtime Gaming (RTG) in its “Red” casino and dozens more games from WGS in the Intertops Classic mobile casino we've never had so much choice. Mobile casino bonus and free spins on mobile slots available until September 30th. Players can enjoy mobile casino games using their existing Intertops Casino or Intertops Casino Classic accounts. Intertops Casino’s $120,000 Oktoberfest casino bonus event continues until October 3rd.